To clearly understand the bar bending schedule of a pile foundation, it is necessary to be familiar about the typical reinforcement details of a pile foundation. Pile foundation is a common type of deep foundation, used for supporting heavy loaded structures when the site under consideration have a very weak soil that is compressible in nature. 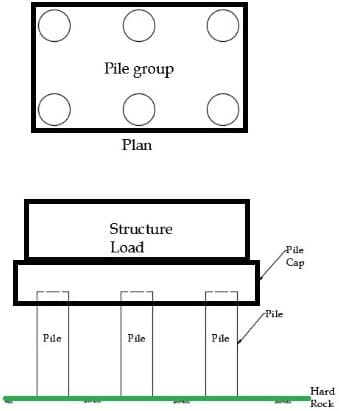 A typical pile foundation arrangement have the load structure supported by a pile cap, which is in turn supported by several piles as shown in the plan and front view arrangement in the below figures. The figure-2 shows the typical reinforcement details and drawing of a pile foundation. The details of pile cap are not explained in this article. The above details are mentioned in the figure-3 below. The Outer rings are provided as helical rings and the inner is circular or spiral ties. The development length ‘Ld’ is provided outside of the column piercing into the pile cap. 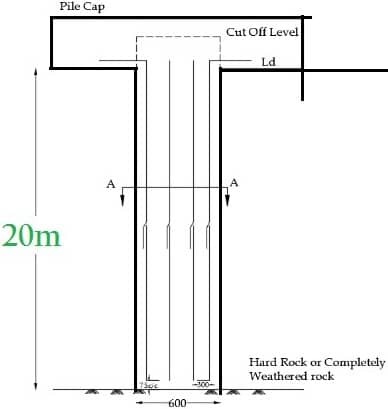 The anchorage length to the recommended amount is provided to the bottom of the column as shown in figure-2. Total Cutting Length for Vertical Reinforcement = Anchorage Length at the bottom of the pile + the height of the pile + development length (40d) + Lap length (50d) – clear cover provided at the bottom. Note: During tying the bar, it is recommended to tie at the middle, as tying at the ends of the bars will be subjected to higher stress values. Here, we have to determine the length of each inner ring along with their numbers arranged. 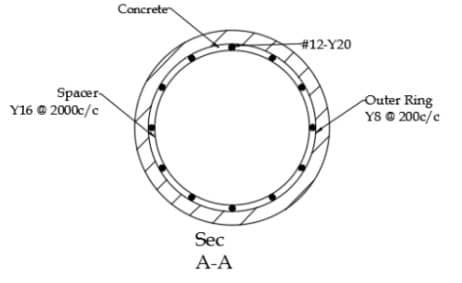 For every specification of outer helical ring, the radius of the same have to be determined.